Established in 2010, this award recognizes remarkable members of the Association of Shelter Veterinarians who have contributed to the advancement of shelter veterinary medicine via leadership, public service, research, education, advocacy, and/or clinical practice. The ASV's intent in conferring this award is to bring attention to excellence in shelter medicine by recognizing those who serve as exceptional ambassadors of the profession. Veterinarians, veterinary students, and affiliate ASV members are eligible; current ASV Board Members are ineligible. Anyone may nominate qualified individuals who are members of the ASV for this award. Recipients receive a plaque, a shelter medicine textbook, and a $250 donation to an organization of his/her choice, and are recognized at the ASV Annual Meeting, held in conjunction with the American Board of Veterinary Practitioners Symposium in October. A nomination form, the nominee’s curriculum vitae (CV) and a cover letter with a brief sketch of the nominee's professional background and a statement pertaining to the individual's qualifications for the award should be submitted by e-mail to [email protected]. Deadline for submission is July 1st. Additional letters seconding, endorsing, or supporting nominations for awards will not be used in evaluating candidates, nor will self-nominations be accepted. The nominations committee will review the nominations and recommend a recipient to the ASV Board, and the ASV Board will vote on the recipient. 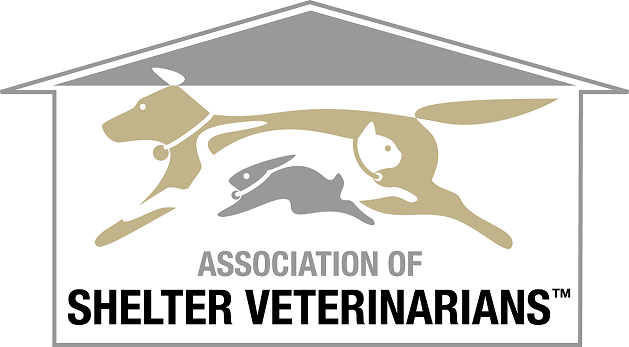 Established in 2018, this award recognizes remarkable members of the Association of Shelter Veterinarians who have been outstanding in their role as a veterinarian to improve community animal health and wellbeing. The ASV's intent in conferring this award is to bring attention to excellence in shelter medicine by recognizing those who serve as exceptional role models of the profession. Veterinarians serving in municipal, private, and/or non-profit shelters and other community animal endeavors are eligible; current ASV Board Members are ineligible. Anyone may nominate qualified eligible individuals who are members of the ASV for this award. 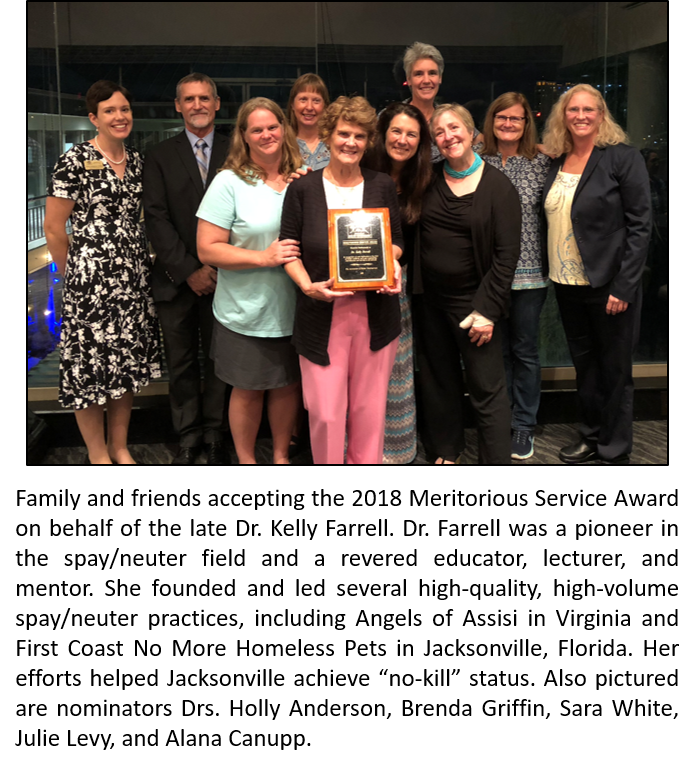 Recipients receive a plaque, a shelter medicine textbook, and a $250 donation to an organization of his/her choice, and are recognized at the ASV Annual Meeting, held in conjunction with the American Board of Veterinary Practitioners Symposium in October. A nomination form, the nominee’s curriculum vitae (CV) and a cover letter with a brief sketch of the nominee's professional background and a statement pertaining to the individual's qualifications for the award should be submitted by e-mail to [email protected]. Nominated individuals, and the individual making the nomination, must agree to the posting of the nominee’s CV and nominator’s cover letter on the ASV website for consideration by the membership. Deadline for submission is July 1st. Additional letters seconding, endorsing, or supporting nominations for awards will not be used in evaluating candidates, nor will self-nominations be accepted. The nomination letter and CV for each nominee will be posted on the member’s only section of the ASV website for review by current ASV members, and an email will be sent to members asking them to vote for the nominee of their choice. The award will be granted to the nominee that receives the most votes.